We’d love your help. Let us know what’s wrong with this preview of Dos Gringos by Frederick R. Andresen. 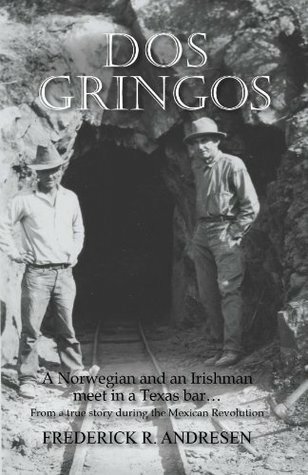 During the Mexican Revolution, a penniless Norwegian and a drifting Irishman meet in an El Paso bar and are hired by a Pittsburg con-man to fix a gold mine in Mexico with parts, which they learn too late, purposely don’t fit. The Norwegian is focused on fixing the mine and needs the money to propose to his sweetheart in El Paso. The Irishman is focused on the local women, During the Mexican Revolution, a penniless Norwegian and a drifting Irishman meet in an El Paso bar and are hired by a Pittsburg con-man to fix a gold mine in Mexico with parts, which they learn too late, purposely don’t fit. Complicating their mission is a mysterious black-suited man selling guns to both sides in the Mexican war, part of Germany’s intrigue to keep America out of World War I—and a German and Brit are there to spy on each other. El Paso is far away. To ask other readers questions about Dos Gringos, please sign up.